Harriet Wilson was a survivor. Now we have proof. 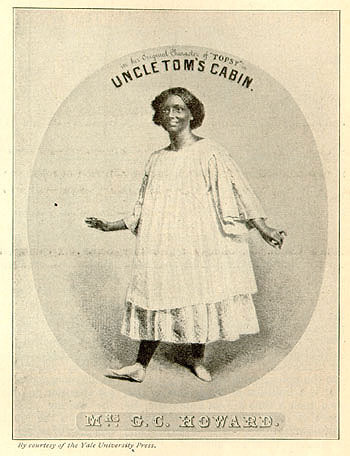 Wilson wrote “Our Nig; or Sketches From the Life of A Free Black,” the earliest known novel by an African-American woman. It tells the story of Frado, a young biracial girl born in freedom in New Hampshire who becomes an indentured servant to a tyrannical and abusive white woman. 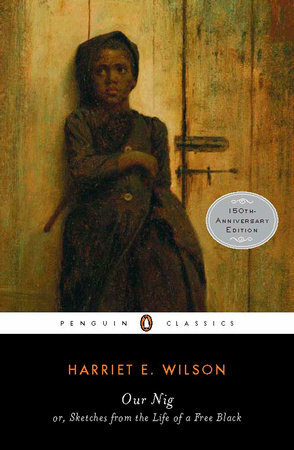 In 1859, when the book was published, the abolitionist movement had created a vogue among Northern readers for autobiographies of escaped slaves, but Wilson’s story of a free black abused by her Northern employer did not fit the established mold, and the novel soon fell into obscurity. Henry Louis Gates Jr., the W.E.B. Du Bois Professor of the Humanities, found a copy of the novel in a used bookstore in the early 1980s and was intrigued by it. Among those specialists who were aware of the book, many doubted whether it was really the work of a black writer, but Gates wondered why anyone in 1859 would identify herself as black unless she were. He started searching for evidence of Wilson’s existence and eventually succeeded in documenting her life up to 1863. The facts he uncovered closely resembled the events in the life of the novel’s protagonist. Gates, who published his findings in a 1983 edition of the novel, concluded that Wilson must have died around the time the historical trail went cold. Now evidence has surfaced showing that Wilson survived almost another 40 years, demonstrating in other areas of endeavor the resilience and creativity that allowed her to try her hand at writing. Read the book at Project Gutenberg here. This course will consider representations of passing (and thus also miscegenation) in nineteenth- and twentieth-century U.S. culture. While passing has often been depicted-and dismissed-as an act of racial betrayal, more recent criticism has suggested that we view these depictions of racial transgression and deception in more complicated ways. In this class, we will analyze various narratives centered around passing and miscegenation as sites through which we can better examine-and understand-the construction of racial identities in particular historical and political contexts. We will ask whether or not narratives about passing and miscegenation challenge the stability of racial categories. Likewise, we will pay close attention to how such narratives also engage issues of class, ethnicity, and gender. Syllabus may include works by authors such as Harriet Wilson, William Wells Brown, Lydia Maria Child, Frances Harper, William Dean Howells, Pauline Hopkins, Mark Twain, Charles Chesnutt, Kate Chopin, James Weldon Johnson, Nella Larsen, George Schuyler, Toni Morrison, and Philip Roth. In addition, this class will also draw on a selection of historical and legal documents, current critical works on race, and films such as The Jazz Singer and Imitation of Life. “Nation, Miscegenation, and The Myth of the Mulatta/o Monster, 1859-1886” examines how Harriet Wilson, Harriet Jacobs, Mary Elizabeth Braddon, and Robert Louis Stevenson use the trope of the mulatta/o monster only to subvert it by showing readers that the real monster is white, hegemonic culture. More specifically, it deals with how Our Nig, Incidents in the Life of a Slave Girl, The Octoroon, and The Strange Case of Dr. Jekyll and Mr. Hyde depict the interracial body as a gothic house, one which is a microcosm for an increasingly hybrid and un-homely nation. The four texts under consideration in my thesis all explore what it means to be black and female (or dark and feminized) in the United States and Britain where to be white, male, and affluent is to have virtually limitless power over the bodies of women, particularly black ones. Drawing upon Nancy Stepan’s notion of “proper places,” this dissertation looks at how interracial individuals challenged existing hierarchies in the mid-to-late nineteenth century by defying racial, gender, and class norms nationally and transatlantically. While many scientists of the period believed that mixed-race people were infertile and headed for extinction, the proliferation of such individuals attests to the fact that the number of racially hybrid people was increasing, not decreasing. For many Victorians and their American counterparts, the rise in this population as well as the shifting roles of black and white women, black men, and the working class compelled them to label these groups. It also heightened their concern with degeneration and their need to polarize black/white, female/male, and rich/poor. Yet, as this project shows, while such binaries are necessarily porous, England and the United States both made use of them to establish and define their national identities vis-à-vis one another. Whereas American writers like Jacobs and Wilson relied on such constructs to shame their country and to shape its future, British ones like Braddon used them to allege national superiority or, like Robert Louis Stevenson, later on in the nineteenth century, to reveal the changing face of the nation. This volume, with a foreword by Henry Louis Gates, Jr., advances efforts to correct the historical record about the racial complexity and richness characteristic of rural New England’s past. In the mid-nineteenth century, Harriet E. Wilson, an enterprising woman of mixed racial heritage, wrote an autobiographical novel describing the abuse and servitude endured by a young black girl in the supposedly free North. Originally published in Boston in 1859 and “lost” until its 1983 republication by noted scholar Henry Louis Gates, Jr., Our Nig; or Sketches from the Life of a Free Black, is generally considered the first work of fiction written by an African American woman published in the United States. With this collection, the first devoted entirely to Wilson and her novel, the editors have compiled essays that seek to understand Wilson within New England and New England as it might have appeared to Wilson and her contemporaries. The contributors include prominent historians, literary critics, psychologists, librarians, and diversity activists. 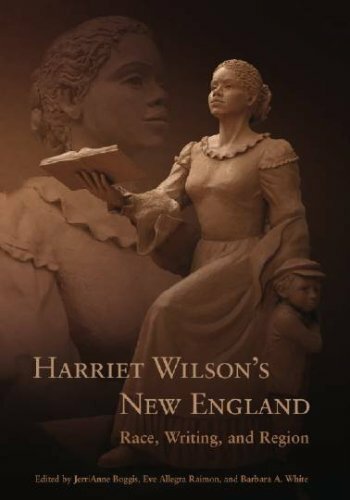 Harriet Wilson’s New England joins other critical works in the emerging field known as the New Regionalism in resurrecting historically hidden ethnic communities in rural New England and exploring their erasure from public memory. It offers new literary and historical interpretations of Our Nig and responds to renewed interest in Wilson’s dramatic account of servitude and racial discrimination in the North. Foreword – Henry Louis Gates, Jr. Since its inception, the United States has been intensely preoccupied with interracialism. The concept is embedded everywhere in our social and political fabric, including our sense of national identity. And yet, in both its quantitative and symbolic forms, interracialism remains an extremely elusive phenomenon, causing policy makers and census boards to wrangle over how to delineate it and, on an emblematic level, stirring intense emotions from fear to fascination. In The “Tragic Mulatta” Revisited, Eve Allegra Raimon focuses on the mixed-race female slave in literature, arguing that this figure became a symbolic vehicle for explorations of race and nation-both of which were in crisis in the mid-nineteenth century. At this time, judicial, statutory, social, and scientific debates about the meaning of racial difference (and intermixture) coincided with disputes over frontier expansion, which were never merely about land acquisition but also literally about the “complexion” of that frontier. Embodying both northern and southern ideologies, the “amalgamated” mulatta, the author argues, can be viewed as quintessentially American, a precursor to contemporary motifs of “hybrid” and “mestizo” identities. 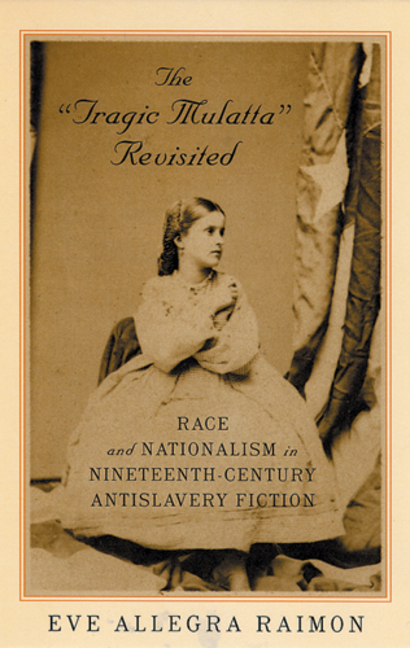 Where others have focused on the gendered and racially abject position of the “tragic mulatta,” Raimon reconsiders texts by such central antislavery writers as Lydia Maria Child, William Wells Brown, Harriet Beecher Stowe, and Harriet Wilson to suggest that the figure is more usefully examined as a way of understanding the volatile and shifting interface of race and national identity in the antebellum period.